Universal Moulders & Engineers, Kolkata manufacturers a wide range of rubber washers. Rubber Washers, can be supplied in any shape from simple round or square designs to a bespoke configuration with numerous holes and or slots across the flange. A leading rubber washer supplier which are available as Neoprene Washers, EPDM Washers, Nitrile Washers, Viton Washers, Natural Rubber Washers and Silicone Washers. Certain factors, be it weather, water applications, oil and petrol applications or temperature prevail can all affect the performance of a rubber washer. Generally, if a rubber washer is to be used as a simple buffer or packer then a natural rubber washer is most suitable for the application, however, if the rubber washer is to be used externally, for example within the construction industry, we would recommend a neoprene rubber washer. Please contact us for more information with regards to the particular grade of material required for your application, to see our different types of rubber and their suitability. We have fast become a leading manufacturer and supplier of all flat rubber washers. Over the past few years UME have invested heavily in new, state of the art, automated machinery allowing them to produce our rubber washer range for a vast amount of different industries which include construction, home appliances, architectural, and automotive trades. UME also has the facility to apply a self adhesive backing to any rubber washer product we produce. 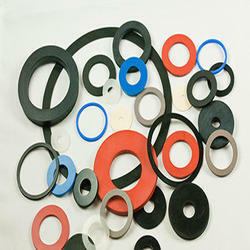 Furthermore, most base materials are held in stock and therefore our rubber washers can be turned around immediately. Thicknesses of our rubber washers range from 0.5, 1mm, 1.5mm, 2mm, 2.5mm, 3mm, 4mm, 5mm, 6mm, 8mm, 10mm up to 12mm. Certain standard sizes are normally held in stock, or can be manufactured immediately, including M5 Rubber Washers, M8 Rubber Washers, M10 Rubber Washers, M12 Rubber Washers, M16 Rubber Washers, M20 Rubber Washers, M25 Rubber Washers, M32 Rubber Washers. Non standard sizes are custom made to the requirements of our customers and with the extensive tooling range we have, most sizes can be supplied without the need for an additional tooling cost for the customer. We are confident that our prices and lead time will be one of the most competitive around. Standard: As per Any Specification. Looking for Industrial Rubber Washer ?